5 kilometers (3 miles) drive from Wenu Mapu lies the border of Huerquehue national park. There you will encounter a wild paradise of dense forests, mountains, and icy streams that have cut deep canyons over countless years. It has a very abrupt geography with hills reaching 2,000 meters in height and deep ravines, originating in the glacial era. Inside the park are 17 lagoons and small pristine lakes, numerous waterfalls and views of nearby snow-capped volcanoes and the Lakes Region. 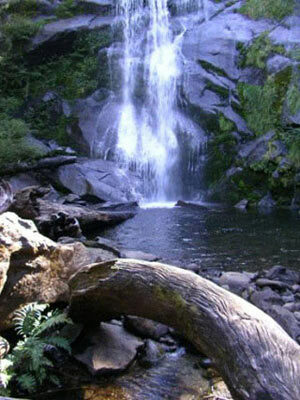 It is a perfect place to take a day hike or spend several days camping in the backcountry. 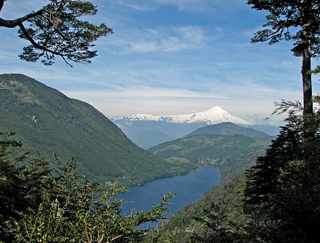 The park is a reserve for the Araucaria tree (Monkey Puzzle tree) and also has abundant Nothofagus forests. You can also see a wide range of birds, especially ducks, and with luck and patience you'll be able to see the woodpecker at work with its impressive red head. 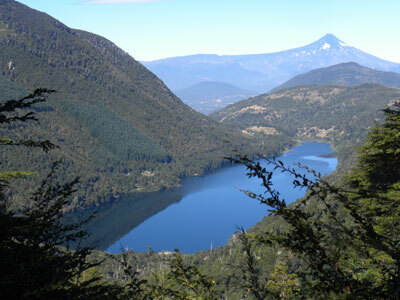 Wenu Mapu is located 3 kilometers before the entrance of Huerquehue National Park and 35 Kilometers from Pucon. Please contact us for detail directions of how to get here. We higly recomend 4x4 vehicle to come to Wenu Mapu. 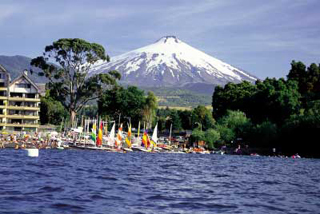 With two National Parks, one private park and other private reserves in its vicinity as well as being located on the Villarrica Lake Shore, the small town of Pucon is a great starting point for a wide range of outdoor activities and adventures. The mountains, rivers, and lakes are known by hikers, kayakers and adventurers. You can also fly to the Maquehue Airport in Temuco, located approximately 7 kms. from the Temuco city center. 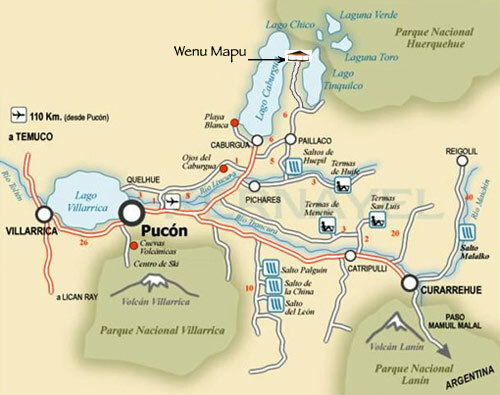 There are intercity minivans connecting you directly from the airport to Pucón, and it is possible to rent a car at this airport. There are frequent daily buses from many cities in the country. From Temuco there are departures every half an hour; and the majority of buses that come from Santiago, travel overnight. Pucon has a rainy climate in the winter and a moderate summer which at times can become a bit hot. The rainfalls diminish around October and creep in around March. But the homogeneous and undying greenness that embellishes Pucon and its surroundings, is a clear signal that the rains can be quite sporadic. In general, it can be stormy at any time of the year. Either way, never fail to pack a raincoat. Apart from the seasonal clothing, it is advisable to be prepared for rain and cold weather at any time of year. It is a good idea to have the necessary equipment for hiking (hiking boots, water containers, back packs, sunscreen, warm clothes, etc. ), swimming suits for hot springs, a flashlight, etc.